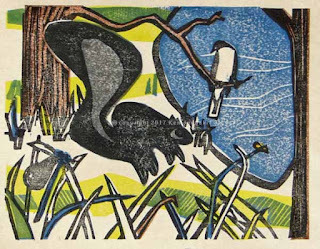 Jumping Gray Squirrel, Eastern Kingbird, Ebony Jewelwing and Zabulon Skipper Moku Hanga print by Ken Januski. On Nishinouchi paper. It's been quite a while since I posted here and though I've been working on a new print for some time I wanted to wait until the print was finished before posting. Above is one of the finished prints. I've done 10-11 and am debating whether to print a few more in the edition. Given all the prepartory work it always seems silly not to print a relatively large edition. On the other hand it is more work! Spring is a time of almost too much natural wealth. There is so much so see, hear, experience, and perhaps draw, paint or photograph from life. But how do you choose a subject for an artwork? For me it often comes from a quick sketch that I've done. Below you can see the field sketch of an Eastern Kingbird that led to this print. It probably wouldn't have just based on the kingbird sketch, but while I was sketching it a Gray Squirrel seemed to jump up straight in the air between me and the kingbird. Perhaps he saw a snake, maybe a grasshopper, or maybe he was just being squirrelly. In any case I tried to get some sense of it down in my sketchbook. As I said these chance encounters often lead to more developed work. My guess is that there seems to be a subject to portray, something more than just a portrait or study. 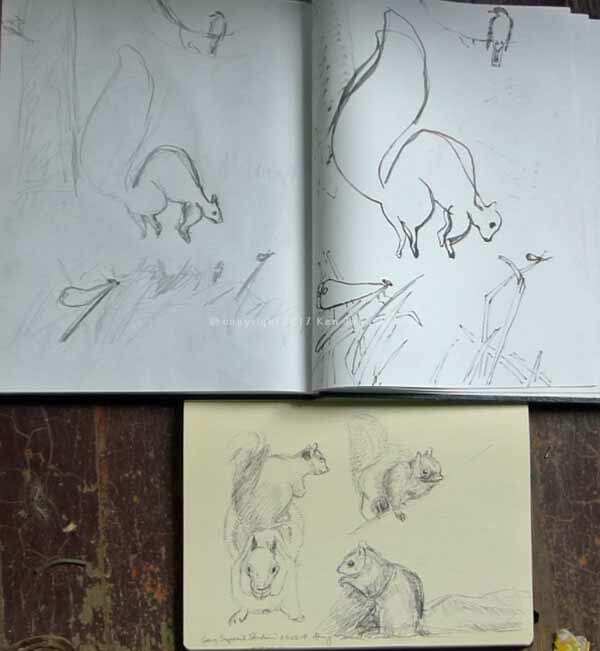 In any case after I got home I started doing various compositional studies for a print, as well as studies as to just how a squirrel that jumped straight up in the air might look. 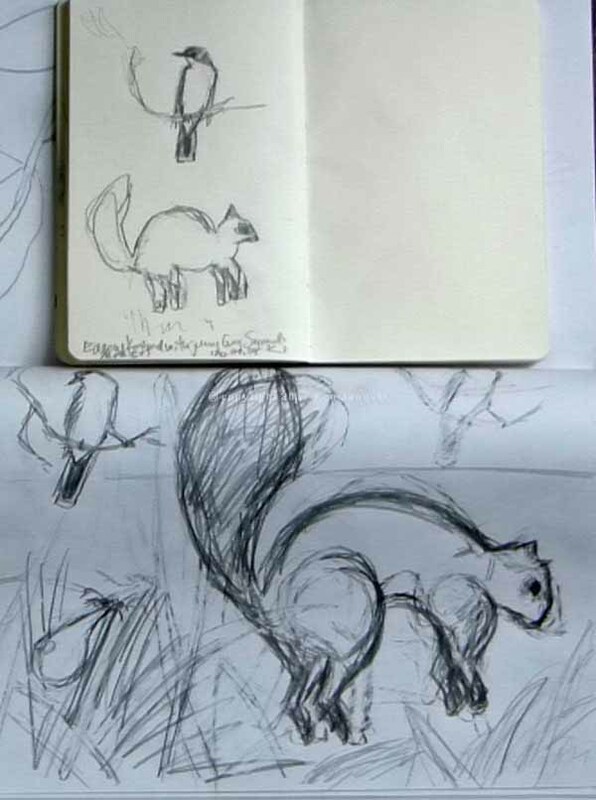 As I did so I realized how poorly I understood squirrel anatomy. So I did some sketches based on photos I've taken over the years. Field Sketch and Studies for Moku Hanga Print. Studies for Squirrel Moku Hanga Print. I'm not going to show all of the various compositional studies I made. But finally I came up with what I wanted. I then drew that with a brush pen onto a tissue like paper, pasted it down on the block that would be the key block(the one with most detail, and at least for me printed in black), and eventually printed that block onto more tissue (Usu Mino paper) that I then pasted in reverse onto the other blocks to be carved. Below is an example. I overdid the amount of Nori used to paste down the drawing(kyogo) and that is what the blotches are in photo below. Anyone who's familiar with moku hanga will know what kento marks are but most people will not. They are registration marks carved into the block itself so that there is a greater likelihood of prints matching up as you print more and more colors. In the kyogo below you can see that I've also included the kento marks from the key block. Once the kyogo dried I used it as a guide as I carved away the non-printing areas and just left the areas I planned to print in color. Pasted down Kyogo for color block. Below are the other blocks, well actually other block. Since both sides of each block can be printed I can get four blocks from two blocks. Additionally I can print more than one color on some of the blocks, though I do have to be careful as I ink up the areas not to brush the wrong color into an area. Below all of the blocks except the black key block have more than one color: gray and blue, brown and a tiny orange area(for the skipper butterfly) and yellow and a tiny second area of black (for the squirrel's eye). 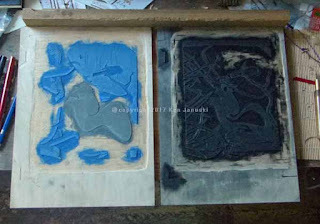 Blue and Gray, and Black Blocks for Moku Hanga print. 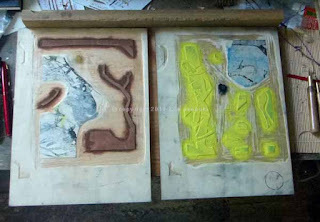 Yellow and Brown Blocks for Moku Hanga Print. 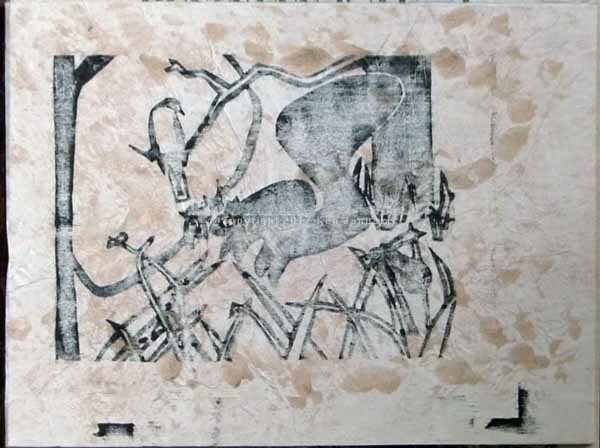 As the title says this is just my second moku hanga print. I'm happy to say it was not as tortuous as the first. 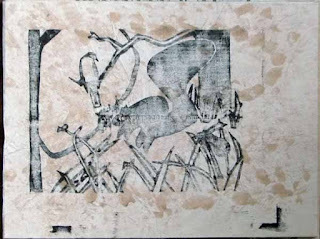 All printmaking methods seem to require a fair amount of technical knowledge and skill, something I really have never liked. But the more I print, regardless of method of printmaking, the more I realize that I just won't be successful without some technical knowledge and skill. Moku hanga seems more complicated than other methods I've tried. Its virtue though is that it can lead to beautiful prints, that is almost thoroughly non-toxic, assuming you don't eat any of your paints/inks, and it requires very little space. I used to print in the basement after carving and designing my prints in my second floor studio. Now I do all my work in the studio. I only go to the basement to clean up. There are many technical problems with moku hanga but based on my vast experience of two prints I'd say that the most difficult is getting consistent ink coverage. This print is not perfect but I've gotten much better with ink coverage. Registration is better and smudges are fewer. It will remain a learning experience. But it is one where I see a bright future. From what I can see of contemporary moku hanga a great deal of it is done with fields of color and NO lines. Since the mastery of line, and other things, seen in ukiyo-e artists and printmakers seems absolutely impossible to match today I have some understanding of this. Who wants to compete with Hokusai? But I like line and see no reason to keep it out of my prints. I also , as in most of my work, like to combine naturalism and abstraction. 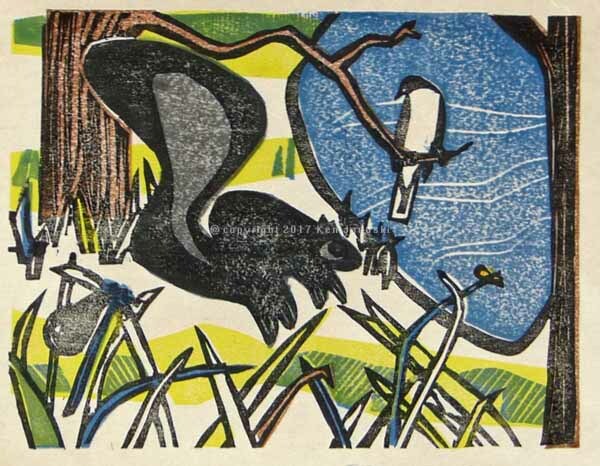 It was that which made printmaking appealing to me to begin with. It is even more so with moku hanga.